IHOP mashes up two classic breakfast dishes with the debut of new French Toasted Donuts, which are donuts dipped in vanilla batter and then griddled. 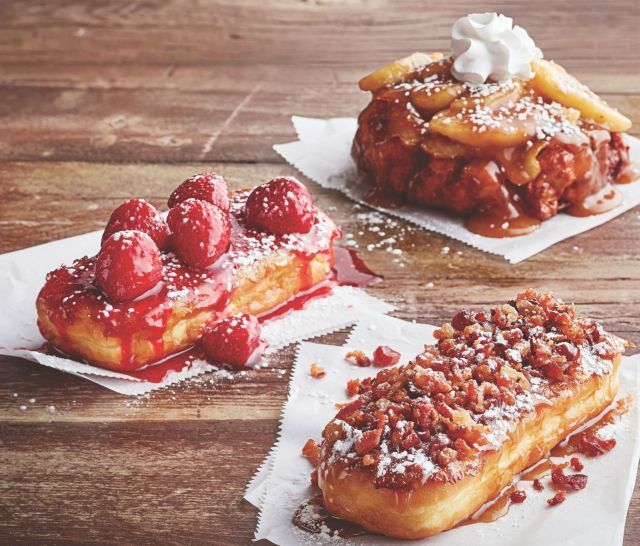 - Bacon & Maple French Toasted Donut - A Bavarian cream-filled donut dipped in vanilla French toast batter, griddled, and then topped with maple glaze and hickory-smoked bacon crumbles. - Strawberries & Cream French Toasted Donut - A Bavarian cream-filled donut dipped in vanilla French toast batter, griddled, and finished with glazed strawberries and powdered sugar. - Apple Fritter French Toasted Donut - An apple fritter dipped in vanilla French toast batter, griddled, then topped with sweet cinnamon apples, powdered sugar, and whipped topping. French Toasted Donuts can be found at participating IHOP restaurants nationwide through September 24, 2017. This isn't the first time IHOP has given a breakfast item the French Toast treatment; earlier this year, they offered a cinnamon roll dipped in French toast batter as well as a slice of red velvet cake dipped in the same.